The Tata Nano is no ordinary car. It was a car that began its journey in 2009 as India's automotive icon, on the back of Ratan Tata's impossible promise of delivering a One Lakh Rupee Car to the world. Seven years later, it has been consigned to an underwhelming fate to say the least. The Nano was reduced to a lesson in marketing don'ts. But now, as part of Tata's rise with the Horizonext philosophy, Tata have wiped the slate clean and built a new Nano  the GenX. Okay. So just another facelift? Well, yes and no. The basic silhouette hasn't really changed. Neither have the dimensions. If you look closely, you'll notice that the front and rear bumpers have been redesigned, as you'd expect in facelift models. The cute smiley front has been replaced by a wide grin, and the reason behind this is not so much a funny joke as it is the radiator which has now been moved to the front. The headlights now get the smoked treatment that you see with the Bolt as well. There's a new infinity theme that extends from external elements like the grille to the insides on the upholstery. But no it's not a mere facelift. Tata have had to put in a lot more work. So there's more than meets the eye? Yes, because now the Nano (drum roll!) comes with an open-able hatch and a boot. 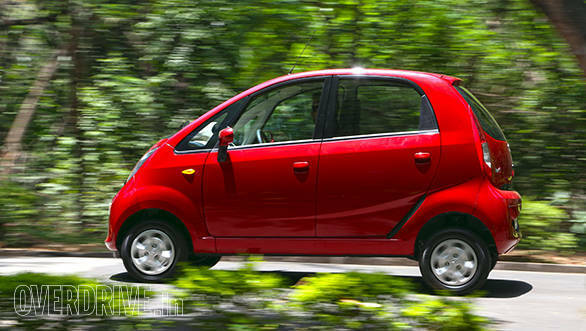 But what you need to realise is that the Nano is a rear engined car so don't expect to use the Nano to move apartments. The rear storage space is a modest 110 litres, while the space up front under the hood remains unusable thanks to the spare wheel. 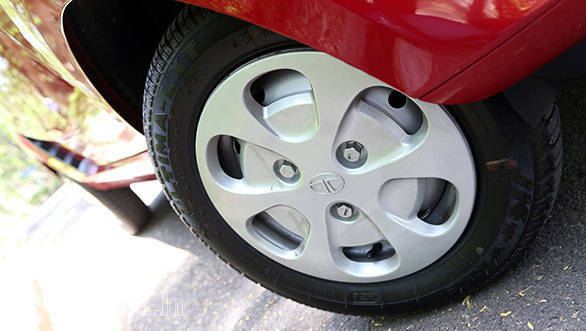 Now, because the bolted rear hatch replaces the welded component, Tata have had to strengthen the body further and that has added about 35kg to the kerb. But that also means slightly better NVH and more energy absorbing capability and hence, safety. Do the insides get a makeover too? The insides too get their share of changes. There's a new rich and chunkier steering wheel now which feels good to use. The instrumentation continues to, annoyingly, be centrally located on the dash but now gets a digital clock, tripmeter and fuel consumption display. The Nano now gets a few smart storage spaces too but the piece de resistance is a four-speaker Bluetooth Amphistream music system. Are you reading this Datsun? What! No changes to the engine? No, it's the same two-cylinder 624cc petrol engine that churns out 38PS of max power and 51Nm of max torque at the rear wheels. It would be prudent to not expect Tata to give the Nano a bigger, more powerful engine because they will have to redo the entire structure to be able to handle the forces. This adds weight and reduces interior room too thanks to the added strengthening elements. I'd put my money on Tata investing in getting the best out of the current engine instead, and it most certainly has a lot of scope for improvement in efficiency and refinement. But Tata have added something to the powertrain that changes the game altogether. It's an Automated Manual Transmission! And that makes the Nano the most affordable clutch-pedal-less car in the world. 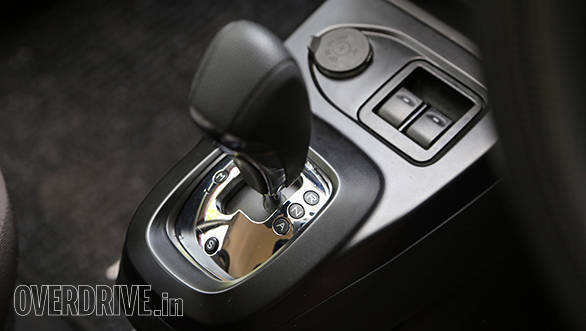 It's a Magneti Marelli actuator and TCU added to a 5-speed manual gearbox, but it's not the same one that you see on the Zest. Interestingly, the Zest uses a dated third generation Magneti Marelli AMT system that has been existing in Europe for a while now, while the Nano gets the new fourth gen. But it's an AMT. How much better could it be? Admittedly, AMTs do have a reputation of not being the most comfortable and smooth systems thanks to the unpredictable gear shifting jerks and the Nano's system isn't devoid of that entirely. There is also a bit of lag between the input and the clutch bite thanks to a slow responding TCU. But once the car gathers momentum, the Nano's AMT is reasonably responsive and definitely much smoother than the one on the Zest. You also get an added 'creep' functionality on the Nano's AMT which makes it similar in operation to conventional automatics  as you ease off the brake pedal, the clutch begins engaging and the car inches forward  ideal for bumper to bumper traffic and tight parking spots. And it's even got a Sports mode. So the Nano transforms into a sportscar? It would be preposterous to even consider that. All the 'S' button does is that it lets the revs build up and delays the upshifts so that you can get maximum power from the engine. So you may get a miniscule added push for those never-ending overtaking manoeuvres. Okay the AMT is practical. Yawn. But there's more. Because the AMT is actually a manual, it replicates its fuel efficiency. 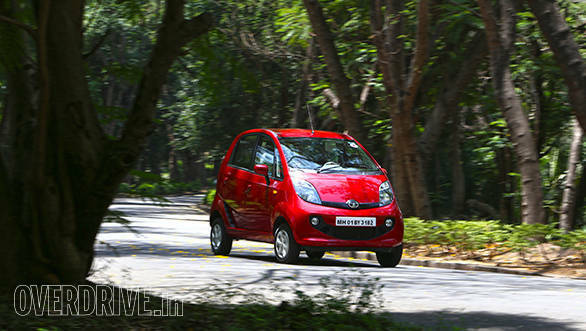 The Nano with the AMT has the claimed capability to run for 21.9 kilometres with just one litre of fuel. 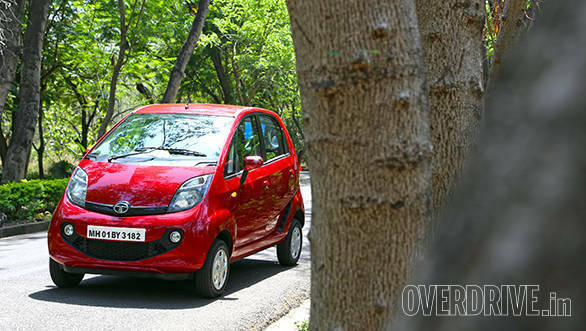 And since that puny 15-litre fuel tank has been replaced with a 24-litre one, you can now expect to drive the Nano for about 500 kilometres on a single full tank. What's the downside? There's always a downside. The AMT mechanism adds 30kg more to the Nano, and reduces about 16 litres of boot space. But compare it to conventional automatic gearboxes and you realise that's actually insignificant. And AMTs are much cheaper than conventional automatics too, so you won't have to spend much more for a clutch-pedal-less Nano either. So, nope. No downside. There definitely are many areas that still have scope for improvement. 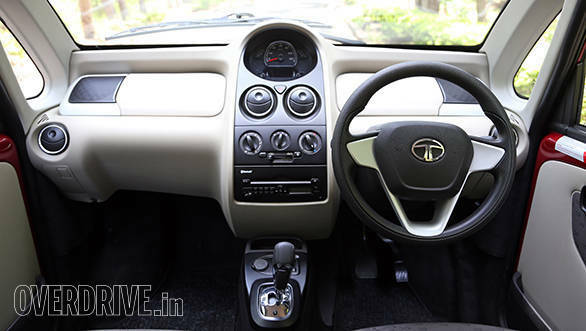 The finishing, for instance  Tata Motors need to iron out glaring flaws like the exposed wires under the steering column or the exposed battery under the seat. My other complaint is the low steering column without tilt adjustment. It's very uncomfortable for taller drivers. These aren't things that require too much investment as they do ingenuity. And that I think, Tata can certainly afford. Neither the ride quality nor the handling of the Nano has changed too much, at least not noticeably. The Nano continues to use the ZF power assisted steering system that boasts a brushless motor for silent operation and an Active Return function that reduces effort to turn at lower speeds. I think Tata can afford to lower their claimed 'SUV-like' ground clearance of 180mm by a small margin thanks to the short wheelbase. This might help reduce the centre of gravity and thereby reduce body roll  which does exist despite the anti-roll bars. The tall stance, short wheelbase and puny tyres don't help either. But the Nano isn't a car that you'll buy for its dynamic abilities. It's driving it in the city traffic that will serve its purpose the best. It is too early to start rubbing hands in anticipation? No, go right ahead. If the Bolt and the Zest are anything to go by, Tata will launch the Nano very shortly now that we've driven the car. You can expect the price to be around the Rs 3 lakh mark and to be honest, that is a price you won't mind paying for the added value, not to mention the retained ones like the interior space and effective air con. With all the added virtues, the Nano GenX has the ability to forge the success it was always meant to have.